Yesterday my daughter and I headed over to Lynn Canyon Park to go for a hike. When she was a wee thing we lived within walking distance of the this pristine forest park. What a backyard we had back then! Lynn Canyon Park starts at Twin Falls. I tell you, walking down the Centennial Trail in this lush forest, with mist coming up off the falls and looking about at the trees laden heavy with moss…oh, and the scent. It had rained heavily on Saturday. Sunday was a beautiful partially sunny day. The forest had the fresh, wet smell of pine. The earthy scent of damp soil mixed in. Invigorating and intoxicating! We descended about 250 feet. Wooden stairs have been constructed and zigzag down the canyon wall. Then over a foot bridge and then we followed the path, which is partial forest and boardwalks and a series of inclines and declines down to the shoreline of the Capilano River. There are many trails that run through here and we will definitely be going back to explore more of them. We could have continued but turned back and made our way back to the car. The real workout was coming back up all the stairs! A great workout. There was a trail race, one of the 5 Peaks races I believe, that was going on. I don’t know that I would want to run through these trails. It was muddy and slippery. I salute everyone who took on the challenge though. Many of the runners had dressed up in Halloween attire. On Saturday evening, I attended a costume party at a friend’s home. A good time was had by all. 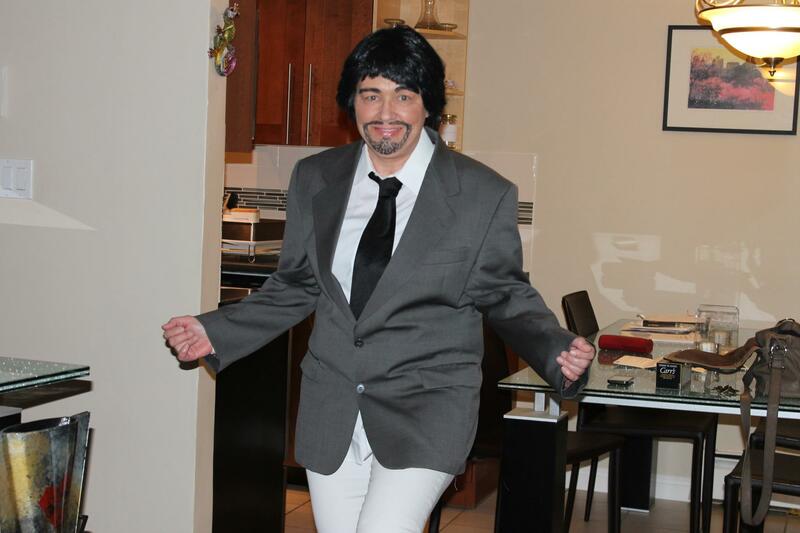 I dressed up as a man. I believe I was very convincing as the creepy 80’s dude who thought he was hot stuff. I was given the moniker of ‘Lou‘ as my alter ego for the night. And you know, this was one of the easiest costumes I have ever put together. I went to a local thrift store to pick up the men’s clothing. I opted to wear my own jeans as I figured it would be more comfortable. The wig I bought was a woman’s synthetic hair wig which I cut to look like a man’s, then drew on a mustache & goatee and penciled in the heavy brows. That was it. Of course, by the end of the evening having scratched and rubbed my chin a few times…the goatee was a wee bit smudged. And I had looked at purchasing the fake mustache and goatee…but I was actually rather appalled at the cost, so penciling it on won the popular vote. We all have to have some fun from time to time. Getting dressed up in a silly costume once a year is indeed fun. I guess, too, we like to get into the character that we are portraying. We can cut loose a bit and move outside ourselves. Halloween doesn’t officially happen for a few more days, but I have had my treat. A great weekend. One that was fun and uplifting. One where I just got to cut loose for a while. And we all have to do that from time to time. Now we watch as this storm Sandy approaches the East Coast of the US & Canada. I do hope everyone will make it through okay and not too much devastation results. Be well everyone.